Spring Market Kick-Starter means Freedom! Advanced technology, easy to use, and empowering to the agent. Hotline America gets info to potential buyers when they want it, 24 hours a day, seven days a week. Your signs and advertising perk their interest, don’t let them cool off. 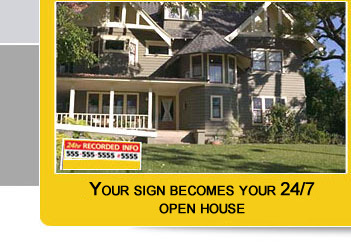 We provide you with a personalized toll free number and extensions for all your listed properties. Your message is always working, even when you’re not. 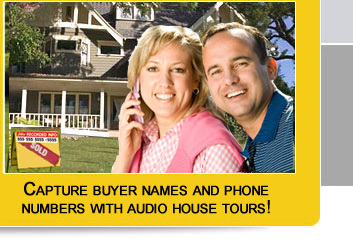 Audio house tours sell more homes! Calling your regular office number often results in just a message (if you are lucky). Lead the pack, supplement your sales tools by inviting interested parties to make that initial phone call and obtain information without pressure. Get them while they’re hot. Callers can be transferred to you immediately, and we’ll also notify you immediately with your messages. You will know exactly who called and we give you their phone number for follow-up. At your request, we'll also send you an immediate text message every time someone calls your hotline. With Hotline America, people know the information about "that house" is available around the clock, so you get more lead calls because potential buyers call while they are motivated. Sellers see your leadership technology and you get more listings. This is your 24/7 Open House to dominate the marketplace. Realtors, agents, loan officers and builders using Hotline America’s 24 hour recorded information service can sell more houses, find more new leads, and gain more new listings. Hotline America is very easy to use and surprisingly low cost – especially for a service with so many features and benefits. It also works great for lease and rental properties. 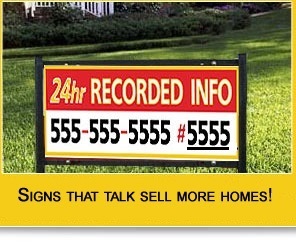 Hotline America is a real estate audio tour service for promoting home sales and conveying information. We capture the caller's phone number, offer the caller your audio tour of the home, and ask whether the caller would like to speak to you now or leave a message. You can also make additional printed information about the property and your services available for callers to obtain by fax – give them something tangible. Get caller activity reports with names and phone numbers daily. When the caller asks to speak to you, Hotline America will transfer the phone call to you immediately at the telephone number you designate. It could be your office, mobile phone or even your home number. You can change the number whenever you like, making the service convenient and useful. All updates can be performed either by telephone or online – it's your choice. If you don’t like to record in your own voice, you can utilize our leading edge “text-to-speech” technology and simply type your information online and your choice of a male or female voice will speak your message – it's all included. Never miss a real estate lead again. Close the gap between you and your buyers instantly! Hotline America BOOSTS THE EFFECTIVENESS OF YOUR ADVERTISING by greatly increasing phone responses from print ads, yard signs, direct mail, and flyers. Imagine getting the phone numbers of the people who are interested in your advertisements, and also being able to observe – through using our unique extensions - which advertising method is really the most effective. This is far better than brochure boxes or info tubes . . . don’t spend more time and money filling up empty brochure boxes and info tubes again and again. Gain new listings from prospective clients by demonstrating the features and benefits of Hotline America that help you sell their home sooner rather than later. Stand out from the crowd, develop relationships, and guarantee that all buyers and sellers will call YOU.